In the Joy of Horses! – Hestakaup! 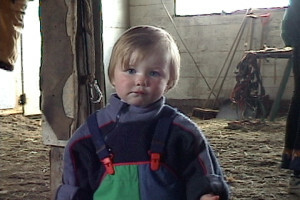 This gives new meaning to the term “Barn Babe”. I actually met Ingunn Ingolfsdottir in her home in Skagafjordur on my first trek in 2000. 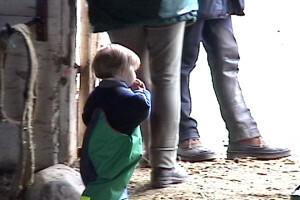 She would not remember me as she was barely a few months old and I did not peek into her bassinet in order to shoot any video, but through the generosity of Brad Vogel, here a couple of photos of her in the stable at Dyrfinnustadir a year later. Now we let´s see how they put Iceland in the Icelander. And now we go to the indoor for some real work on another stallion, Hágangur! And also with a real teacher, Mette Mannseth, a trainer, competition rider, and one of the riding teachers at the national equine college, Hólar. And Mette will introduce us to the horse, Hágangur frá Narfastöðum. Of course, any dressage lesson has to have some serpentines. Even for a five year-old. And here in Iceland, we must practice our tölt. Of course! Take away the stirrups, knot the reins, and what do you have? A very happy little rider! And balanced, too! I understand that at the Landsmot 2008 Hagangur was honored for offspring. I don’t know much about it. I was not there and there was no coverage that I could find in the Icelandic press. All know is that there was some kind of parade of the honored stallions and that Ingunn rode her Hagangur for the crowd. It must have been quite a moment. All I have to share with you is this still picture by Martina Gates. I would have given anything to have shot video of this moment and to share with you the experiences of Ingunn and her family. Unfortunately I could not get the interest from Icelandic horse organizations that I needed in order to solicit sponsorship to continue the Hestakaup project. This last trip to Iceland, in 2006, turns out to have been my final one.